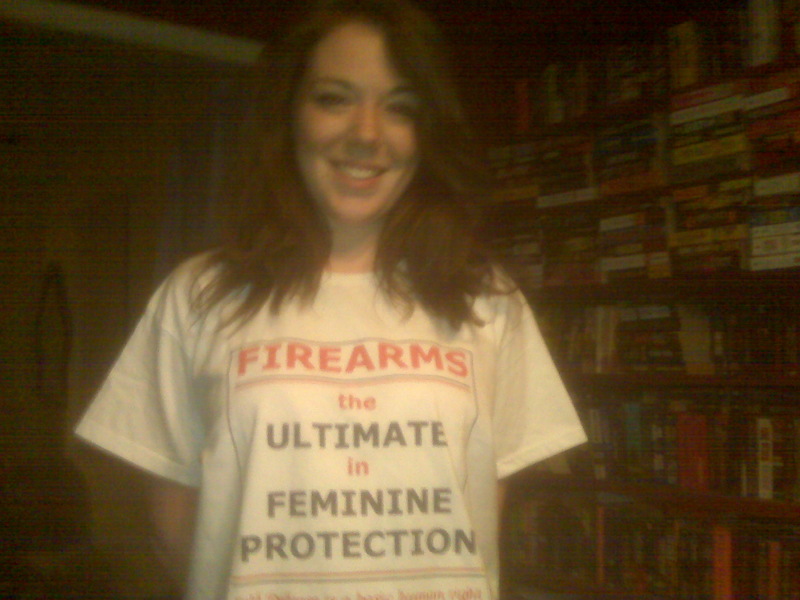 I got her this t-shirt at the New Hampshire Liberty Forum. Am I a doting father, or what? Dan Mitchell, If I was president, I’d hire you as my Economic advisor. BTW, you’re a great dad! I love your stuff Dan, use it on my site all the time, you have a beautiful daughter and with you as a dad she will have the right stuff to run our government….My friend you have no idea how much I’ve learned from you. J.C.
My wife had started shooting with a .22 caliber childs rifle when she was 10. She soon became a better shot than her father. She is responsible for me buying firearms and going to the range(I have loved guns all my life but my mother was dead set against firearms in the house). Living in NJ it was hard,but having someone close to shoot with made it easier. One of the things that attracted me to my wife is that when we met, she owned just as many firearms as I did. I’ve had my own dilemmas about whether raising my children as eagles in a world where the sheep are a majority is a wise idea. If they are going to be confined to a herd, perhaps they will be happier if they’ve never flown. Or do the geese who lay the golden egg get to fly away? Where to? Now the real question. .45 or 9mm? Is she single? And does she have her own range bag?